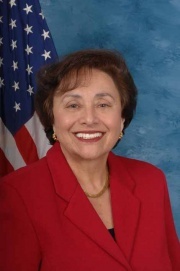 Congresswoman Nita M. Lowey is a Democratic member of the U.S. House of Representatives from New York's 18th district. Congresswoman is currently serving her twelfth term in Congress, representing parts of Westchester and Rockland Counties. She was first elected to the U.S. House of Representatives in 1988 and served in the Democratic Leadership in 2001 and 2002 as the first woman and the first New Yorker to chair the Democratic Congressional Campaign Committee. A member of the powerful House Appropriations Committee, Lowey serves as Ranking Democrat of the State and Foreign Operations Subcommittee and a senior Member of the Labor, Health and Human Services, and Education Subcommittee and the Homeland Security Subcommittee. Lowey was born in the Bronx; graduated from the Bronx High School of Science; and received a Bachelor's Degree from Mount Holyoke College. She served as Assistant Secretary of State for the State of New York before being elected to Congress. Nita and Stephen Lowey have been married for more than 45 years. By February 20 2019 endorsers of Alexandria Ocasio-Cortez's HR 109 (Green New Deal) included Nita Lowey. On the State and Foreign Operations Appropriations Subcommittee, Lowey has also worked to ensure that diplomacy and development remain key pillars of our national security strategy, particularly in Iraq and Afghanistan. Called “one of the engines of pro-Israel activity on Capitol Hill” by the Forward, Lowey has been a leading Congressional proponent of a strong U.S.-Israel relationship and the Appropriations Committee's chief advocate of the annual U.S. aid package to Israel. In October 1991 Patricia Schroeder led a delegation of fellow congresswomen, including Louise Slaughter, Barbara Boxer, Eleanor Holmes Norton, Nita Lowey, Patsy Mink and Jolene Unsoeld to the Senate to urge a delay of the vote on the nomination of Clarence Thomas to the supreme court. In June 1997 George Miller of California and Nita Lowey of New York signed on as co-sponsors of the Communist Party USA inspired Martinez Jobs Bill. The Council for a Livable World, founded in 1962 by long-time socialist activist and alleged Soviet agent, Leo Szilard, is a non-profit advocacy organization that seeks to "reduce the danger of nuclear weapons and increase national security", primarily through supporting progressive, congressional candidates who support their policies. The Council supported Nita Lowey in her successful House of Representatives run as candidate for New York. Signatories included Rep. Nita Lowey. Lowey received $54,000 from the Service Employees International Union in lobbying funds. The Working Families Party backed Lowey in 2014. The Alliance for Retired Americans Political Action Fund endorsed Nita Lowey in 2014, also 2012. Lowey received $1,000 in lobbying funds from Planned Parenthood in 2008. Lowey has been supported by EMILY's List during her campaigning.